Vietnam’s tuna export revenue is likely to reach the target of US$500 million in 2018 after hitting $351 million in the first seven months of this year, while growth has been seen in the majority of markets. 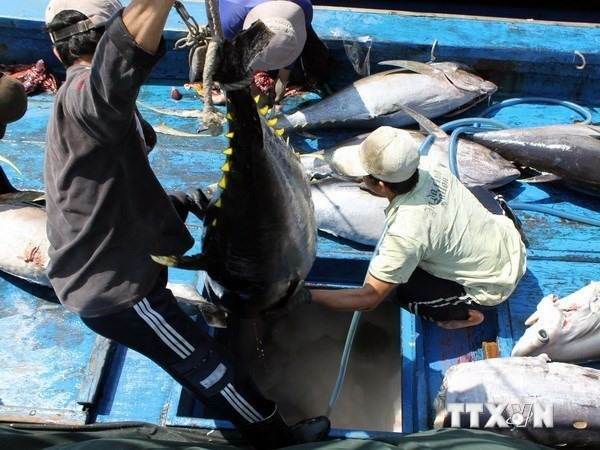 According to the Vietnam Association of Seafood Exporters and Producers (VASEP), in July, earnings from tuna exports were estimated at $48.4 million. The major eight Vietnamese tuna importers were the US, the EU, Israel, ASEAN, Japan, Canada, Mexico and China. VASEP General Secretary Trương Đình Hòe said that September was normally the peak season for tuna sales when importers often strengthen buying, therefore, the goal of $500 million in exports for the whole year was feasible. Hòe said that among the top three markets of Vietnamese tuna, a decrease was seen solely in the US. Specifically, Vietnam shipped $116.3 million worth of tuna to the US in the first seven months of 2018, down 8.9 per cent year-on-year. Meanwhile, a rise of 23.7 per cent was seen in the EU market to $82.71 million, and a surge of 55.7 per cent in the Israeli market to $42.35 million, boosted by the shipment of canned tuna which almost doubled to $29 million in the first half of the year. Commenting on the Japanese market, Hòe said that Japan had dropped to fifth position from one of the top two importers of Vietnamese tuna, explaining that Japan’s demand might decrease or it has found another source of supply at more reasonable prices. Vietnam had only 3 per cent of the market share in Japan, while that of Thailand is 58 per cent, Indonesia 19 per cent, and the Philippines 17 per cent. However, Vietnam’s tuna exports to Japan had increased this year, he said. In the first seven months of 2018, Japan spent $15.87 million on Vietnamese tuna, up 25 per cent year-on-year. At the same time, tuna imports of the US rose continuously in the first six months of 2018, with upturns seen in imports of canned processed tuna and frozen tuna fillets. Statistics from the US side showed that the country spent $902 million on tuna products in the first half of 2018, up 17 per cent compared to the same period in 2017. The top five tuna suppliers to the US, by volume, were Thailand, China, Indonesia, Vietnam and Ecuador. Notably, China has overtaken Vietnam in supplying tuna to the US. Accounting for 70 per cent of total canned tuna imports, China has become the US’ second largest supplier, making it a weighty competitor of Thailand and Vietnam. Due to the escalating US-China trade war, this September the import tax rate for fresh and frozen tuna from China will increase sharply, creating favourable conditions for other countries to increase their tuna exports to the market. But the details are not yet known for the export of canned products. Hòe asserted that higher demand for tuna in the festive season at the end of the year would push importers’ buying. However, he was worried about the stability of supply capacity in Vietnam’s tuna sector, as along with domestically caught tuna, the country still has to import the product as a material for export.